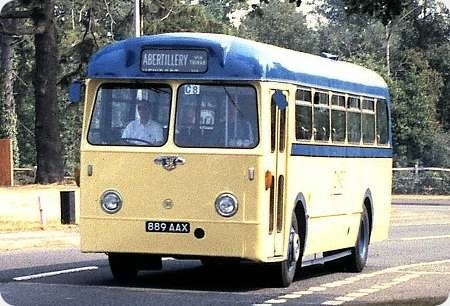 889AAX is a Leyland Tiger Cub from the fleet of Jones, Aberbeeg. According to the Keith Jenkinson book of 1978, she is an OPSUC1/3 from 1959 with conversion to OPSUC1/3T at a later date. The PSVC listing for 2013 shows her without the ‘T’ suffix and says she was first registered in 1961, so she must have been stored for a while. The body is by Weymann, to B44F configuration. We see her in Netley, on her way to the rally on 9 July 1995. It’s quite unusual for there to be a significant delay between construction and entry into service. The chassis numbers of these vehicles indicate that construction of their chassis was commenced in late 1958, and most vehicles with similar-age numbers entered service in 1959. The Weymann body numbers similarly indicate 1959 vehicles, but chassis/body numbers were often issued when the relevant bit was ordered, rather than when it was actually constructed, so it’s not possible to draw any firm conclusions there. (Leyland were an exception to this). The registration AAX reversed dates from 11/60 to 2/61, so it would appear that these vehicles were indeed registered (or possibly re-registered) in early 1961. BLOTW gives the chassis designation as home-market PSUC1/3 rather than OPSUC1/3, but, either way, it would seem that these vehicles were among the minority of Tiger Cubs to feature epicyclic gearboxes. I believe this bus was part of a cancelled export order for Trinidad, which would explain the delay between construction and registration. Do you mean that it would have taken a while to get the vehicles back from Trinidad? I’m not sure I follow the logic. I see that I omitted to mention the fact that the batch was of three vehicles, Jones 98-100 (889-91 AAX). David, I may be wrong – I usually am! – but I suspect what Roy means is that the vehicles were constructed but never exported, being stored until a buyer was found. As originally built the windscreens included push-out ventilators at the bottom, as might be required for hotter climes. These were removed by Jones because, as far as I recall, they were not water-tight. I presume the order must have been cancelled at a very late stage during bodying (why? – penalties would have to be paid), and that the bodied vehicles then sat around until an operator was prepared to pay for some semi-auto Tiger Cubs . . . and that operator must have been Jones. 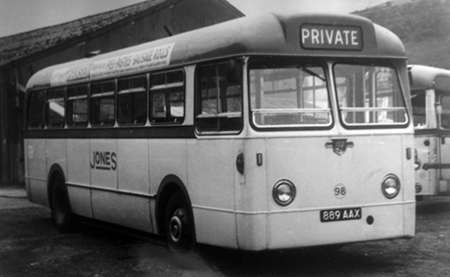 Doug Jack refers to these in ‘The Leyland Bus’ – "Three overseas OPSUC1/3’s with Weymann bodywork (B44F) were diverted in 1960 from Trinidad Agencies to Jones of Aberbeeg." The picture of the Jones tiger cub on the way to Netley rally has me driving it as I was the owner at the time. Regarding the difference in build and going into service was as was mentioned, a cancelled order. Three were left at Southampton docks so I was told. They originally had full length sliding side windows as well as the push out vents in the windscreens. While at Netley rally, I discovered I had a slow puncture in the front offside tyre, so had to put the spare on. This was of dubious condition as it was on the bus when I bought it. I took it easy on the return journey to South Gloustershire, but as I exited the roundabout at Salisbury collage there was a bang , it had blown. So there we were with no back-up Luckily I had a good few passengers, so we jacked it up intending to put the original tyre on. As luck would have it, another old bus from the rally appeared and the owner offered to take it to a garage and inflate it, so although it was slowly leaking, we got back home safely, albeit with a rather deflated tyre. Assuming it was indeed two-pedal, this doesn’t appear to have impressed Jones, who continued to specify manual transmissions for vehicles purchased new, even though their operating territory would perhaps have favoured semi-automatic. As for the two-speed axle, these were never as common on semi-auto vehicles as manual, although certainly not unknown.